Jo Nicholson, who has raised an astonishing amount for us, shares the story, in her own words, of why and what she did to raise such an incredible amount. 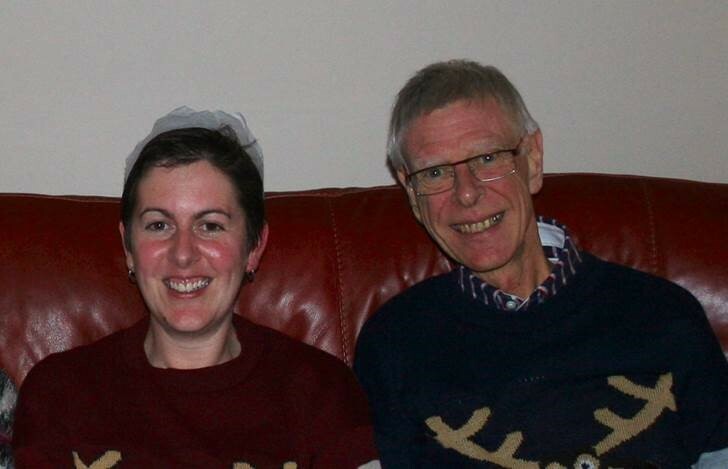 On December the 19th 2012 my world fell apart when my Dad was told by the consultant he had pancreatic cancer, and there was nothing they could do to treat him due to the location and stage of the tumour. After a very brave 3 month battle my Dad passed away in the March aged 67. My Dad was a very positive man, determined to fight the cancer to the very end and only 10 days before he died he sang in Liverpool Cathedral with Brymbo Male Choir, of which he was a member. diagnosis of terminal cancer was given. This is when I became aware of Pancreatic Cancer Action and the event ‘London to Paris Cycle’, I put the two together and that’s where my challenge started and the fundraising began! I had to raise £1,650 to take part in the event which seemed a mammoth task, I thought I would raise as much as possible and make the difference up myself. I mentioned it to my friends, family and colleagues. Admittedly a lot thought I was crazy cycling 300 miles especially as I hadn’t been on a bike for 12 years, but still everyone wanted to support me. People sponsored me, colleagues did a cake day in the department (I’m not a baker so thought safer to donate and eat cake!) it raised £200!….amazing! I still had a massive task ahead to reach the £1,650 mark so I had a plan, a charity night. I’d never done anything like this before but I have to say it was an incredible experience, admittedly stressful at times but well worth it. I had a lot of support from friends to help, there was a raffle, auction, Brymbo Choir singing, a buffet and disco. Local stores donated prizes for the raffle from steam mops to boxes of chocolates. I’d written to various places for auction items, the top item being a signed photo from Katherine Jenkins (my Dads favourite). An article was in the paper about my challenge and the charity night, tickets were £5 each, I’d sold 100 tickets which I was pleased with. I was getting closer to my target! The evening went very well, the room was packed (about 200 people) and the total at the end of the night was a staggering £3,200!!! I was totally blown away by this amount, I’d just doubled what I was aiming for and money was still coming in! I continued with my training for my cycle challenge in April. It was tough at times but when things hurt I would think this is nothing, my Dad must have been in agony at times and he kept pushing on. The challenge itself was an incredible journey, both physically and emotionally. I saw wonderful countryside, made new friends and achieved something I thought was beyond my capabilities. If anybody was wondering whether to embark on any kind of fundraising challenge I would certainly recommend it, especially for such a worthy cause. My reasons for doing it were very personal, only 2 years ago I never imagined I’d have to deal with losing my Dad so early. It’s helped me through a very difficult time and humbled me knowing how generous and caring people are. The final amount raised was over £7,500…………totally amazing!! !